Wonder Woman’s first annual of the DC Rebirth era arrives just in time for her big screen debut. If the movie is half as good as Wonder Woman Annual #1, it’ll be a blockbuster. Instead of telling an extended tale, the annual gives us four vignettes by different creative teams – highlighting different aspects of our heroine. The first story features the team of writer Greg Rucka and artist Nicola Scott. The story picks up on Wondy’s Year One saga by chronicling her first meeting with Superman and Batman. 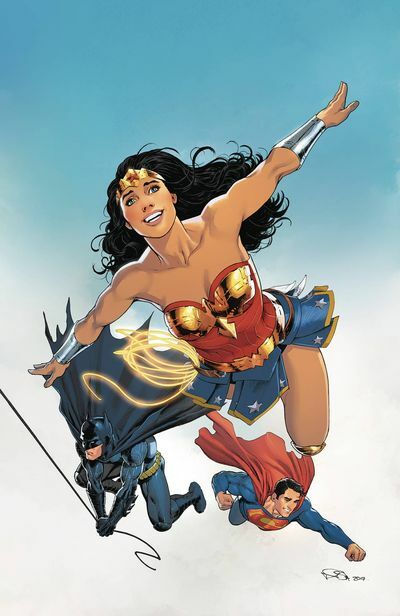 This enjoyable tale showcases the DC trinity at their best: Wonder Woman full of hope, Superman as the optimist and Batman… well, as Batman – suspicious and untrusting. Scott’s drawings are fantastic, illustrating Wonder Woman as the powerful hero she is. Rucka’s story, while light on action, fills in an amusing backstory. If it’s action you want, the second story from writer Vita Ayala and artist Claire Roe starts off with a bang: King Shark is about to be executed for a crime he didn’t commit. Invading the country of Markovia, Wonder Woman shows off her many powers, and her lasso, by making short work of the executioners. The story is classic Wonder Woman – plenty of action sprinkled with hope. The third tale by Michael Moreci and drawn by Stephanie Hans pits Princess Diana against a monster threatening a peaceful Japanese village. However, this is no simple monster of the month story, because Wonder Woman knows the would-be attacker. Exquisitely drawn by Hans, each image jumps off the page. You’ll really that you are in Japan. The final story is by writers Collin Kelly and Jackson Lanzing and artist David Lafuente. This tale pits Wonder Woman against a monstrous kaiju. Again, Diana must choose between violence or compassion. The tale – and the issues – provides plenty of both. Wonder Woman Annual #1 is the perfect jumping on point for new readers. The comic also gives longtime fans an assortment of fantastic Wonder Woman stories. Whether you’re planning on seeing the new movie or not, make sure to pick up this comic. Wonder Woman Annual #1: DC Comics, Released May 31, 2017, Written by Greg Rucka, Vita Ayala, Michael Moreci, Collin Kelly and Jackson Lanzing; Art by Nicola Scott, Claire Roe, Stephanie Hans and David Lafuente; $4.99.